Doors at 6:00 PM. Begins promptly at 6:30 PM. 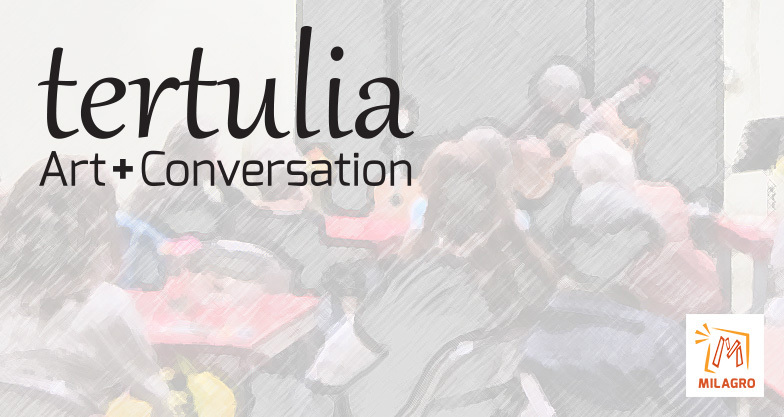 tertulia: Art + Conversation occurs throughout the season with a goal to bring artists and audiences closer together, in an intimate setting. 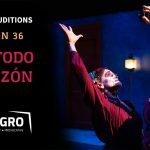 The series celebrates the multi-disciplinary Latino talent of our region, featuring emerging and established artists and creating conversation around their unique talents. Each event is different, tailored to the specific artist. 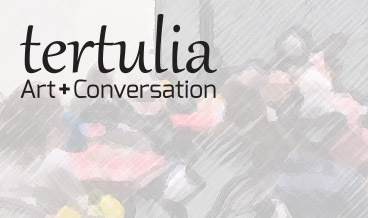 tertulia is free. Space is limited, and reservations are strongly encouraged. Wine and beer for sale. Using moveable type and a cast iron press, the mujxeres of Letra Chueca Press will share details of their journey on opening the only bilingual letterpress print shop in town, the importance of printing in the digital age, and invite guests to pull their own prints. Daniela del Mar is a multicultural, latinx mutt. Raised in Nashville, Tennessee she trained as a painter desde muy chica. Before pursuing a degree en algo que le pareciera pretencioso, she hitchhiked across tres continentes in search of a time with no división entre la vida y el arte. Después de varios años de tramping, she finally settled in the lush Northwest to attend Lewis & Clark College donde se graduó with a BAS in Hispanoamerican Literature & Studio Art. In what seemed como otro rumbo, she began apprenticing at a local book arts center to study bookbinding and letterpress printing. 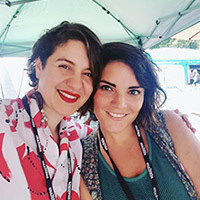 En 2013, co-fundó Letra Chueca Press, the only imprenta bilingüe en Portland that makes work for a Spanish-speaking culture that supersedes borders. Camila Araya Pérez is a graphic designer, printer, and an Art / Spanish preschool maestra from Chile. She came to Portland, Oregon searching for resources to empoderar her voz and decolonize lo que le enseñaron. Her creative practice takes form at the MFA Applied Craft + Design (PNCA + OCAC) where she found su alma: la imprenta de tipografía móvil, a traditional method of printing. This ancient technique allowed her to reconnect with her manos, corazón, and voice. Letterpress lit la ruta for her to find a compañerx with same ideas and hilos to embroider a kind of home in Portland. In 2014 they began the journey of Letra Chueca Press, a womxn-run, latinx letterpress print shop keeping traditional methods of printing and bookbinding alive. Rosa and Sherman will be sharing on their journey through music and dance involving the community in teaching and learning. Crossing borders, transmitting traditions and creating culture. Rosa Floyd has been performing with Milagro since 1995, including appearances in Alas del Huracán, Xandu Ya’, Canta y no Llores, and many Posadas. Originally from Guadalajara, Jalisco, Mexico, she obtained a Master’s Degree in Interior Design at the University of Guadalajara. Upon moving to the US, she found her second calling as an educator and earned her second Master’s Degree in Early Bilingual Education at Portland State University. Currently she is a Dual Language kindergarten teacher at Nellie Muir Elementary in Woodburn, OR. For 18 years she has worked with students of all grades and backgrounds, using ballet folklorico as a way to teach cultural awareness and bring her community together. A dancer since the age of six and performed professionally with many ballet folklorico groups. Rosa performs with Cosecha Mestiza, Grupo Huitzilin, and Colectivo Son Jarocho de Portland. 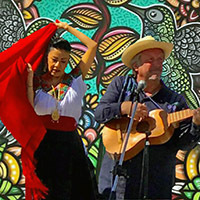 Sherman Floyd, along with his wife Rosa, has been working with Milagro for 22 years first as a member of the Milagro Bailadores, then in many Día de Muertos and Posada productions. Sherman is a teacher who has been using music to get his students excited about language and culture for 23 years. Growing up in Portland, he started playing rock guitar at 10, played folk-blues with friends around town and discovered Mexico in high school. He lived in Guadalajara after graduating, where he met Rosa. He received his MAT from Lewis & Clark College and has taught Spanish, ELL, and bilingual content classes in Hillsboro, Parkrose and Portland. He has traveled and studied extensively in Mexico, Cuba and Spain, learning from masters of Afro Cuban and Afro Mexican traditions. He currently plays with Son Huitzilin and Colectivo Son Jarocho de Portland. Lesslie will be talking about her experience pursuing Music Education as a Woman of Color and creating space for students to enjoy the best of two worlds! The evening will culminate with a performance of her high school advanced mariachi, Mariachi Tradición, as they prepare to attend the Tucson International Mariachi Conference. Lesslie started playing the violin at the age of 6 in the first grade. She graduated from the University of Oregon School of Music and Dance with a Bachelor of Music in Music Education and has studied violin with Fritz Gearhart at the University of Oregon. She played with the University of Oregon Symphony, with the tango band Combustion Chamber Orchestra from Eugene, Mariachi Centella from Medford, Oregon, Mariachi Mexico en la Piel, Mariachi Corona Continental, and mariachis from the Portland area. 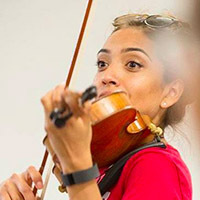 She currently teaches string orchestra and mariachi at three schools in the Forest Grove School District, teaching grades 5-12.